We have gained worldwide reputation with our range of state-of-the-art X-ray data collection systems for crystallography and material research. In fact, “Mar” has become a synonym for high-performance X-ray detectors and goniostats, that are renowned of being “best of their kind”. Far beyond technical specs, the mar345 image plate detectors and the mardtb goniostats have become a legend for their reliability. We are proud to say, that they are truly “Made in Germany”. The world’s most highly acclaimed image plate detector, featuring a huge active area of 345 mm diameter, software selectable pixel sizes of 150 or 100 microns and an unbeatable cost/performance ratio. Popular in home labs as well as synchrotrons for protein and small molecule crystallography, powder diffraction, texture analyses and other material sciences. No other area detector data with higher quality! In August 2014 we introduced the new model mar345=. It keeps one standard fine read-out modes with either 150 or 100 µm pixel size. We then added 4 new ultra-fast read-out modes with 150 µm pixel size. The read-out times are now as short as 9 seconds - world record! The gain in speed has only neglibile loss in data quality and is therefore highly suitable for screening. Did you know that you can upgrade your existing mar345 detector to the mar345s? Please ask for a quotation! With the EIGER R series of detectors we are proud to bring the ultimate Dectris technology to your home lab. The R series detectors come with a 10Hz frame rate and a small pixel size of only 75 microns. You have a choice between the 1M model with an active area of 77 x 80 mm and the 4M model with a size of 155x162 mm. Both fit nicely on the mardtb goniostat and can be combined with a generator to form a marYX2G data collection system. Leading technology pixel detectors for synchrotron (X/S series) or home laboratory (R series). The R series detectors come with a read-out time of only 7 ms and allow for very fast fast data collection. Depending on your budget, you can get a 200K detector with a size of 70x84 mm, a 300K detector (84x106 mm) or a 1M detector (169 x 179 mm). All of them fit nicely on the mardtb goniostat and can be combined with a generator to form a marYX2G data collection system. High-performance single chip CCD detector for synchrotron or home laboratory. Ideal for crystallography, SAXS, X-ray diffraction, or imaging, the SX-165 features a round 165 mm diameter active area, high dynamic range and 1 sec read-out time. An optional frame-shift mode of data collection allows time-resolved studies on the order of milliseconds. The world’s fastest and most innovative large-area CCD X-ray detector for protein crystallography and other X-ray diffraction experiments. The HS series detectors come as single chip variants (SX) or with multiple chips (MX) with up to 25 tiles. The MX Series detectors offer seamlessly tiled arrays of fiber-optic coupled CCDs, with no inactive strips between them. Deep cooling, ultra-fast readout with up to 140 frames/sec, low noise, and high sensitivity. The most advanced goniostat for computer-controlled data collection. A unique feature is its capability of aligning itself to the X-ray beam - just a single mouse click is enough! At least 14 motors take care of positioning the sample or the detector or the entire instrument. 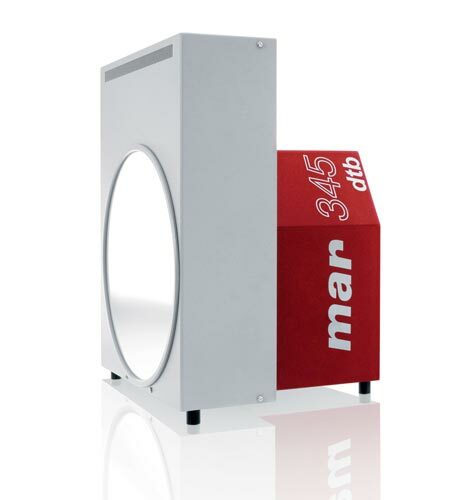 The mardtb is the perfect platform for use with either mar345 image plate, PILATUS3R 1M/300K/200K pixel detector, EIGER 1M/4M pixel detector, Rayonix SX-165 or MX-225 CCD detector not only on home sources but also on synchroton beamlines. The easymount goniostat is an extended version of the mardtb "desktop beamline" featuring an automatic mount and retrieval mechanism for both comfortable and safe sample handling under cryogenic conditions. This is a very nice tool, in particular for high-throughput crystal screening. A compact, robust and rather inexpensive automated sample mounting, retrieval and storage system for the mardtb "desktop beamline". The instrument allows unattended data collection of 19 samples. An integrated bar-code reader keeps your crystals organized. You want to go for the ultimate high performance in-house system? Then don't think any longer and take the latest innovation in X-ray generation technologies, the Excillum MetalJet generator based on a liquid gallium alloy anode. This generator makes a perfect match with a high performance DECTRIS EIGER 4M or PILATUS3 R 1M X-ray detector mounted on our mardtb "desktop beamline" goniostat. The system is completed with an Oxford Cryosystems cryo-cooler including a marLiN2 automatic liquid nitrogen refill system, a nice experimental table and an easy-to-use radiation enclosure. Take a state-of-the-art micro-beam sealed tube generator with a specially designed high-performance optics, add a mardtb "desktop beamline" and a mar345= image plate detector to it plus a cryo-cooler, put it into a shiny cabinet and you are getting a truly powerful yet very affordable complete X-ray data collection system - just perfect for macro-molecular crystallography. No water and electrical installations required - it will fit anywhere in your lab. And: do forget about those maintenance budgets you are used to see elsewhere! Want a DECTRIS PILATUS3 or EIGER instead of the mar345? No problem, just ask for it. The marcam is a CCD camera coupled to a screen that converts X-rays into visible light. It will display an image of the direct X-ray beam in 20 fold magnification on a TV monitor.